Multi-epoch data including both images and catalogs for the wide-field five-band imaging survey were released to the astronomical community on January 28, 2019. 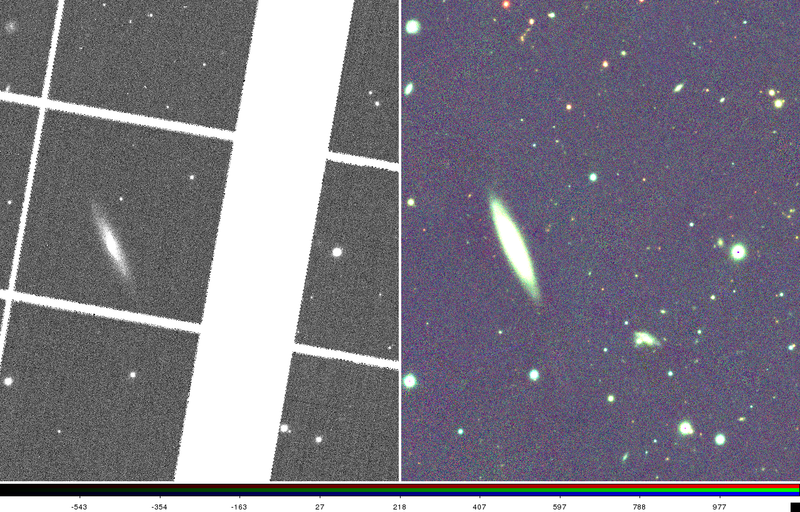 The second data release from the Panoramic Survey Telescope and Rapid Response System (Pan-STARRS) survey was opened to the astronomical community on January 28th, 2019, and is available from the MAST archives. 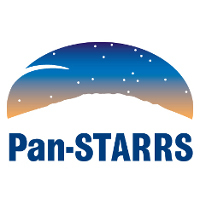 Pan-STARRS1 (PS1) is the first part of Pan-STARRS to be completed and is the basis for both Data Release 1 (DR1; 2016 December 19) and Data Release 2 (DR2). Links to access the PS1 DR2 data as well as the PS1 documentation can be found at https://panstarrs.stsci.edu. The PS1 archive includes images and catalogs from several defined surveys, including observations of three quarters of the sky (the 3Pi Survey, which is available in DR2) carried out several times per filter and over a four-year time span. PS1 DR2 is the first release to include the time-dependent photometry, astrometry, and images collected by PS1. The total data volume of the release is approximately 1.6 petabytes, including a 150-terabyte database along with the single-epoch and stacked images. The catalog includes more than 2.5 billion objects having detections at two or more epochs. In total, there are more than 70 billion detections with an average of ~50 epochs for each object (~10 epochs per filter). 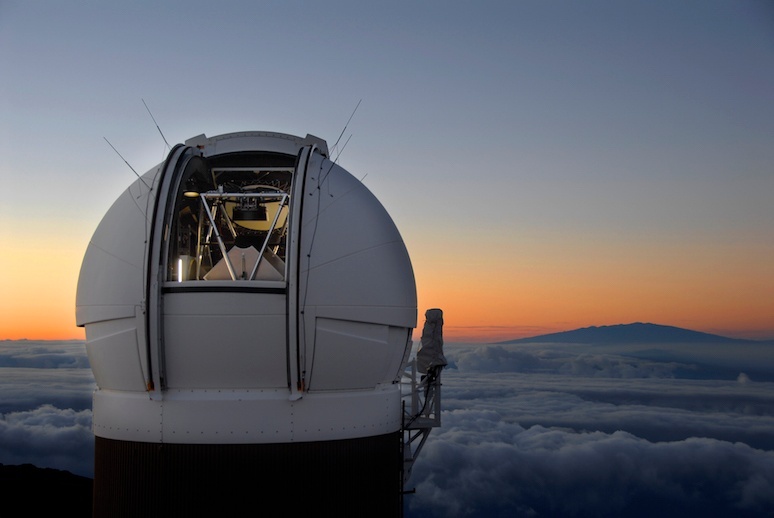 Pan-STARRS Observatory on Mt Haleakala (Maui). A simple image search form for retrieving image cutouts and full images for both the stacked and single-epoch images. A powerful new catalog search form provides a simple tool to search the catalogs for objects near a sky position. The new interface features the ability to constrain searches on any catalog parameters along with an easy-to-use API for scripted access. 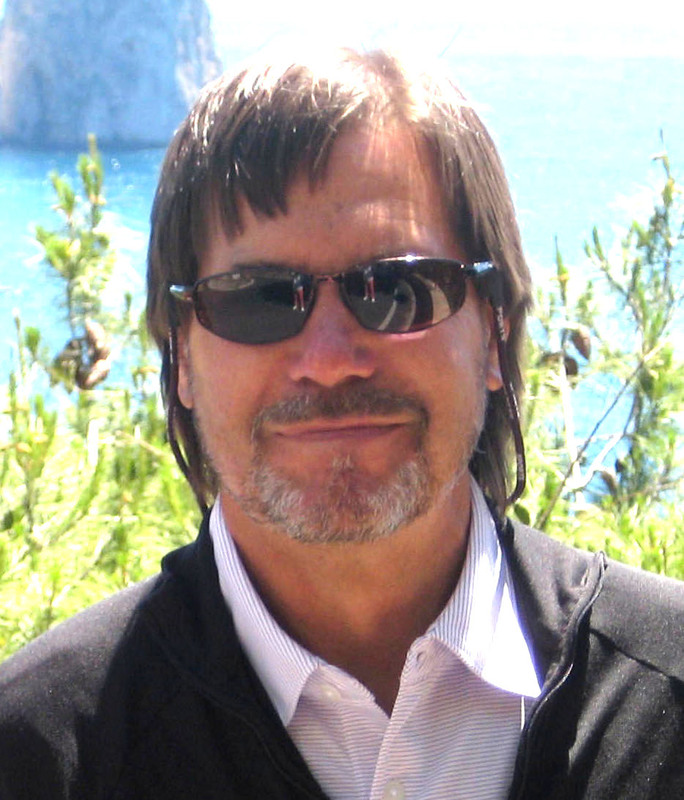 A CasJobs SQL interface allows expert users to craft more sophisticated queries. A new VO TAP service allowing access to PS1 DR2 through a variety of VO-enabled tools. See our ‘How to retrieve and use PS1 data‘ page for more information and links to additional documentation. Note that there are also sample Python Jupyter notebooks that query the DR2 catalog using both the new MAST API and a Python interface to CasJobs, and that extract image cutouts. An additional notebook sample for DR2 TAP access is also in development. Example of a single warp (left) and stack (right) of a galaxy. 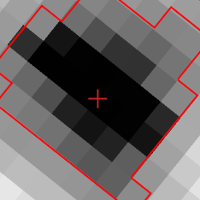 The source catalogs created from the stacks (also in DR1), which include point-source and extended-object photometry measured from the stack images is included. Deep, co-added stack images made from the multiple exposures taken over the survey (also in DR1). Single-epoch warp images (new in DR2), which are the result of resampling and realigning the camera images onto a common pixel grid. Mean values of the point-source and extended-object photometry from the single-epoch warp images (also in DR1). Photometry and astrometry at each epoch are included in the Detection table and the ForcedWarpMeasurement table (both new in DR2). The PS1 catalog astrometry and photometry are well calibrated, with median astrometric errors for brighter sources (18–19 mag) compared with Gaia are about 20 milliarcsec (the astrometric calibration is based on the Gaia reference frame). Systematic photometric errors are about 7 millimag. To obtain help using the archive, please check the PS1 Frequently Asked Questions page or contact the Archive Helpdesk. MAST websites are receiving an updated design with a new look, and improved layouts and organization. Beginning this week, the MAST website will receive a large number of updates over the course of 2019. This ongoing project will include new page organization, designs, and layouts in an effort to modernize MAST's look, and make it easier to navigate MAST's many tools and services. The current rollout includes the MAST front page, several major MAST-hosted missions, and the High-Level Science Products landing page, among others, with further updates in the near-future. 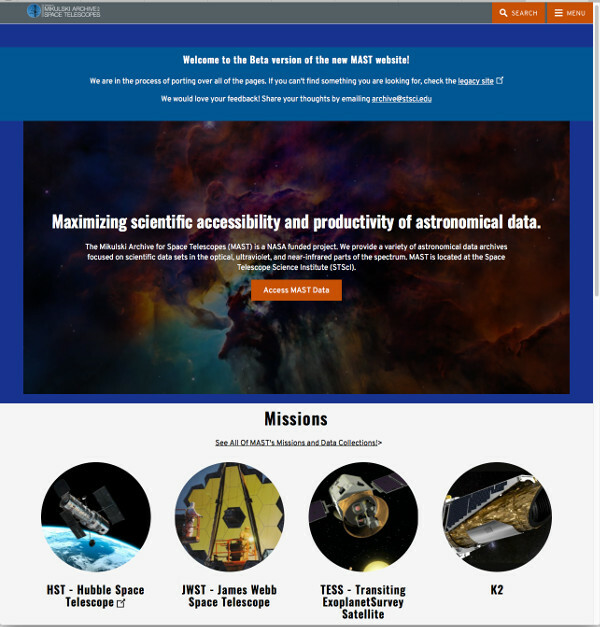 Explore the new MAST front page! Our first updated individual HLSP page is also available for UVUDF, with more on the way. The legacy site remains available while we transition, and all your bookmarks should continue to work as they have, but if you have any questions, concerns, or other feedback on the new pages please contact the Archive Helpdesk! Public TESS data now includes 2-min. cadence data for sector 4, the first data sets for sector 5, and the first multi-sector data products. These are the first multi-sector data sets released, and contain products (light curves and figures) associated with the transit-signal threshold crossing events (TCEs) found by the TESS mission pipeline after stitching together multiple sectors of light curves on each target. These data can all be accessed via the MAST Portal, the MAST API, from exo.MAST, bulk download scripts, or through Amazon Web Services. 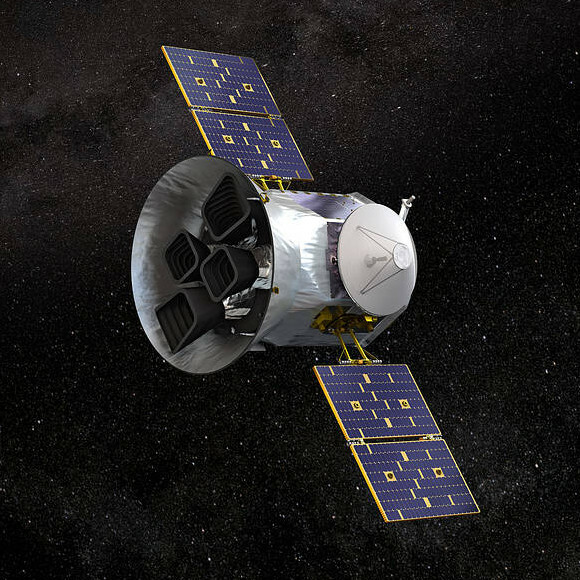 See the TESS Archive Manual for a summary of various ways to access TESS data. HLSP collection includes upgraded processing, new stars added, new high-level data product for sub-exposures. Figure 1. Schematic, far-UV segments of ASTRAL targets. Tracings are rendered in negative: darker shading indicates higher intensities. Figure 2. Example of new high-level data product, illustrating post-processing steps for sub-exposures (most fundamental observation type). Top panel shows echelle-order-merged sub-exposure spectrum (blue curve) of the calibration WD BD+28o4211, taken 2015-09-22 in setting E230M-2707 through the 0.20.2 aperture with an exposure of 425 s. Center panel depicts “active” echelle blaze correction. Bottom panel is a check of CALSTIS wavelength calibration and ASTRAL -distortion correction. Full details are available at the sub-exposure processing summary page for this exposure. ASTRAL is a combination of Large Treasury Projects in HST Cycles 18 and 21, involving dozens of investigators. 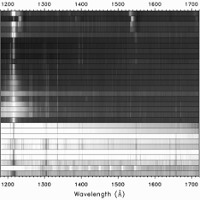 The objective was to collect full-coverage ultraviolet (1150–3150 Å) spectra of representative bright stars over a range of temperatures, using HST’s high-performance Space Telescope Imaging Spectrograph (STIS). These UV “atlases” complement state-of-the-art ground-based optical and infrared spectra of the same objects. Harboring resonance transitions of key light elements and important metals, UV spectra can diagnose diverse phenomena, from the massive winds of hot stars to the multi-MK coronal outer envelopes of cool stars. The fine spectral resolution available with STIS allows us to de-blend close lines and extract Doppler velocity information. Between 2010 and 2018, ASTRAL projects observed 37 different stars with STIS, recently adding two new types: four F/G metal-poor turn-off stars and two calibration hot white dwarfs. Multiple visits provided time domain coverage and mitigated a number of instrumental effects. Recently, all the ASTRAL spectra were re-processed through CALSTIS using updated and custom reference files. Then, the outputs were corrected to improve the wavelength scales by applying a high-order distortion correction; to compensate for “spectral bending,” which can occur with the narrowest STIS slits if the focus had drifted; and to optimize the echelle blaze shift. Next, multiple exposures in the same grating setting were combined, and the many grating settings covering the full UV range were stitched together. An illustration of the far-UV segments of the original ASTRAL sample, plus Alpha Cen AB, is shown in Figure 1. In 2018, a new high-level data product was introduced to help visualize the processing steps for each observation at the “sub-exposure” level. These sub-exposure products can be found at the bottom of the data tree for each target. An example is shown in Figure 2. Details and caveats concerning the observing strategy and processing steps, and a portal to the datasets, can be found at https://archive.stsci.edu/prepds/astral/ and http://casa.colorado.edu/~ayres/ASTRAL/. ASTRAL is intended to support diverse explorations for many years to come. Because it might be decades before the next generation high-resolution UV spectrometer flies, it is vital to carry out archive-minded projects like ASTRAL now, while we still have access to a remarkable instrument such as STIS. Additional questions about the ASTRAL collection and accessing the contents may be sent to the MAST Archive Helpdesk. New and updated High-Level Science Product collections at MAST include a new set of corrections to GALEX spectral fluxes, Kepler light curves optimized for asteroseismology, and new planetary candidates from TESS. 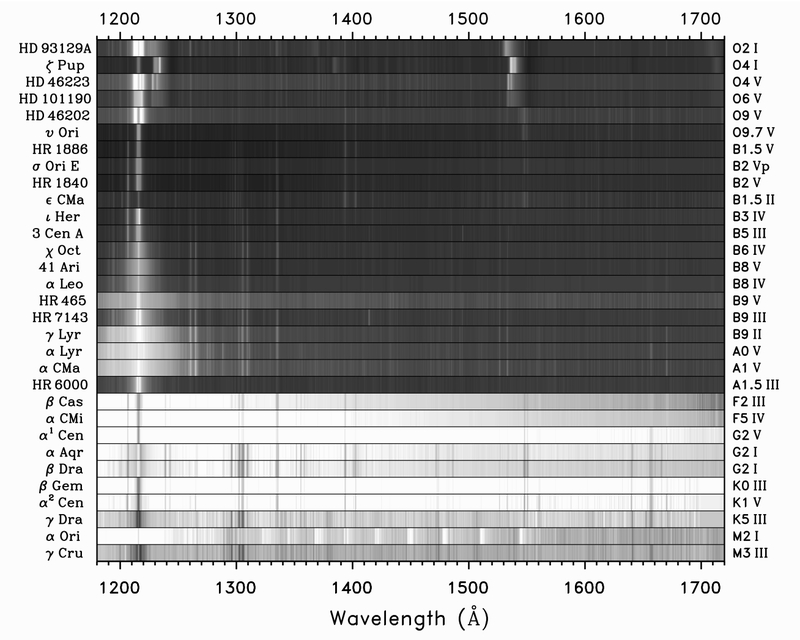 GALEX-FLUXCAL (Bohlin & Bianchi 2019), a collection of 18 IUE spectral energy distributions (SEDs) on the CALSPEC scale that provide a correction to GALEX spectral fluxes, available in both text and FITS formats. This HLSP also includes the correction in 50 Angstrom bins from 1300 - 3000 Angstroms. While GALEX spectrophotometry is repeatable to only 10-20% in regions of good sensitivity, the average flux correction presented here has a precision of ~3%. 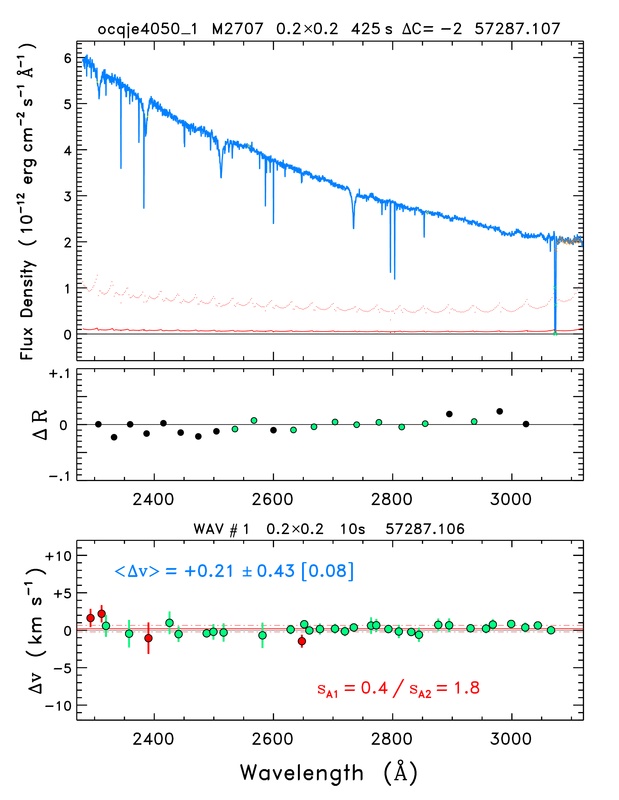 The KEPSEISMIC collection provides Kepler light curves optimized for asteroseismology. For each pixel in the pixel-data file, a reference weighted flux value is computed as the 99.9th percentile of the flux divided by its error representing a measure of the signal-to-noise ratio. The resultant light curve is processed through the implementation of the KADACS software, which corrects for outliers, jumps, and drifts, properly concatenates the independent Kepler Quarters in a star-by-star basis. It also fills the gaps shorter than 20 days in long cadence data following in-painting techniques based on a multi-scale cosine transform. The resulting light curves are high-pass filtered at 20, 55 days (quarter by quarter) and 80 days (using the full light curve at once) yielding three different light curves for each target. The team has provided the detrended light curves, the power spectra, and preview plots for more than 28,000 Kepler stars, and more will be released soon. New TESS-DATA-ALERTS from Sector 4, identified from the Sector 4 Full Frame Images by the MIT Quick Look Pipeline. Since these are FFI-based, no 2-min. cadence data are provided as part of the HLSP update. The Sector 4 FFIs are publicly available at MAST.